Kurt teaches live-instruction and internet-based adobe construction courses for Adobe in Action. If you are interested in building your own home using sun-dried earthen bricks as the primary building material this series of courses is a great way to get started. More information about the classes can be found on the AiA adobe certificate page. 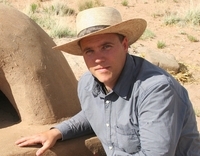 Kurt holds a Certificate in Adobe Construction from Northern New Mexico College. He is also certified as a Specialist for Building with Earth by the Dachverband Lehm (German Association for Building with Earth) and the Handwerkskammer Ulm (Ulm Chamber of Trades and Crafts). Kurt was an instructor at Northern New Mexico College from 2006 to 2012. In addition to the classes he offers through Adobe in Action he is currently offering college-level adobe courses at Santa Fe Community College. Adobeisnotsoftware was founded in 2009 to inform, enable and advance adobe construction in California. We are actively working to reform California building regulation and remove ill-informed barriers to adobe construction.